Code Computerlove has launched a Manchester version of its acclaimed The Higher Lower Game to support local charity Forever Manchester. 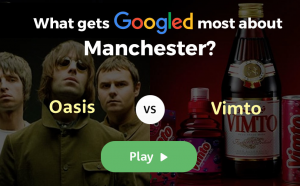 The new game asks players to guess which of two Google search terms about Manchester is most popular, for example whether “Manchester City” has a higher monthly search volume than “Media City”, or whether “Champagne Supernova” is Googled more than “Voodoo Ray”. The goal is to get the most correct answers in a row. Code’s original Higher Lower Game has been played more than half a billion times, and on the week of its release reached the number one spot in the iOS App Store chart. The new game’s homepage encourages people to support regional charity Forever Manchester, which funds and support thousands of community projects across Greater Manchester. The game’s designer Charles Burdett, from Manchester-based Code Computerlove, said: “As a Manchester business we’re keen to support the local community via charitable organisations in the region. "With the Higher Lower Game being such a phenomenal success, reaching millions of people who seem to really love the moments of delight and astonishment when the answer to an in-game comparison is simply unbelievable, we recognised that this was a great way to help raise awareness of Forever Manchester." Code, which was acquired by MediaCom last year, was recently appointed by Manchester Airports Group Plc.